The young woman who was injured in Friday night’s shooting incident in Warrenpoint is fighting for her life in a Belfast hospital. Alice Burns, 21, was seriously injured in the shotgun attack which claimed the life of 37-year-old Wayne Boylan. She suffered serious injuries to her face and neck and was taken by ambulance to Daisy Hill Hospital in Newry, but has since been transferred to the Royal Victoria Hospital in Belfast where she remains in the intensive care unit. Yesterday afternoon, a spokesperson for the Belfast Health and Social Care Trust described her condition as “critical”. Independent councillor Jarlath Tinnelly, who was on the scene at Lower Dromore Road shortly after the shooting on Friday evening, wished Miss Burns well and said he hopes she makes a “speedy recovery”. “This was an absolutely horrific experience for this young woman and a life-changing event for her and her family. “I would want to wish her well and I hope she makes a speedy recovery,” he said. 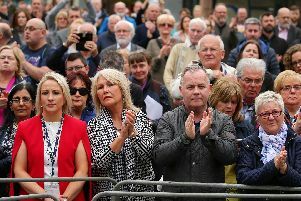 Local SDLP councillor Michael Carr, who knows Miss Burns’ grandparents, said: “Alice comes from a well-known family in Warrenpoint, she has a wide circle of friends, all of whom are hoping and praying that she can survive this. According to Miss Burns’ Facebook profile, she is a former pupil of St Mark’s High School and previously studied at Southern Regional College.